A VOW I PLAN TO KEEP!!!! I just officiated my umpteenth wedding this past weekend in Malvern, Pennsylvania. I truly wish all the best of God’s richest blessings upon Steven and Bethany as they begin the great adventure called marriage! Love isn’t easy, though. And love is sure lots more than mere giddy feelings in your tummy and sweaty palms when he or she walks by! Actually, genuine commitment is a choice of the will and the true foundation that this verb called love should be built solidly upon. Too many individuals are going into marriage wrongly thinking that “until death do you part,” means that they will stay together until the untimely death of their love or the sensation that they are “still in love” is no longer real which by the way is not an accurate interpretation of the essence of the sentence at all. As a matter of fact, it is this kind of faulty rationalization that has the divorce rates skyrocketing! You have got to mean what you say and say what you mean and when you make a promise- at the very least be ready to intend to keep it! It just saddens me how many couples seem so ready to give up before they even have had a chance to look up! They don’t even give their holy matrimony an honest effort once the rocky roads begin to appear on the horizon. The last I checked, I made sure that I still included the words “for better or for worse, for richer or for poorer, in sickness and in health and until death do us part” as an important component of the ceremony. Do we not even heed the words that we are saying? Are we just robotically repeating what is fed to us without even engaging our whole hearts into the sacred vows that are crossing gingerly across our lips? Oh just let me kiss the bride and get on to the honeymoon already! I recently came across an amazing story that I believe every married couple or those who are intending to get married should take the time and invest their futures to reading! There was actually a movie out earlier this year based upon the story but as in the case of most movies- the book is so much better and carries much more weight than Hollywood is ever willing to invest into a story because for them it is too much about entertainment and not enough innertainment! When Kim Carpenter uttered the words, “Until death do us part,” to his new bride Krickitt during their wedding service, he was making a promise that he was determined to keep! Little did he know that keeping that promise would take him to the edge of almost losing his sanity in the process! The two met in September 1992 when Kim, an assistant athletic director and head baseball coach in New Mexico, called a California sportswear company to purchase team jackets. Krickitt Pappas took his order. Kim fell in love with the voice that attended to him. After lots more calls to “check” on the orders, Kim also discovered that they had much in common and were both Christians. Soon they were talking for several hours a week. It was still the day of landlines and very big long distance phone bills! In April of the next year, they finally met in person for the first time. Neither was disappointed with what they saw! Kim would say about that encounter, “It was like I had known Krickitt all of my life.” He proposed two months later, and they got married September 18, 1993. It truly was the stuff that dreams and fairy tales are made of. But it didn’t take long for the hard times to appear at the door step of the Carpenter family. Less than ten weeks after their wedding, their vows were put to the ultimate test. As they drove to visit Krickitt’s parents for Thanksgiving, Krickitt swerved to miss a slow-moving vehicle and was broadsided by a truck as a result of her actions. Their car flipped twice before landing upside down. Kim suffered a broken rib and contusions to his heart and lungs, a concussion, and a broken hand. But the car’s roof collapsed around Krickitt and fractured her skull. She would hang upside down for 70 minutes before rescuers were able to free her. The doctors doubted she would survive. Krickitt’s parents arrived the next day. Told of the slim chance of recovery, they joined Kim in prayer. That day the swelling in her brain started to subside, and her dangerously low blood pressure miraculously began to rise. Within ten days she was off life support but remained in a coma. As Krickitt awoke 21 days later, Kim soon discovered that she would never be the same. The trauma to her brain caused retrograde and posttraumatic amnesia–erasing from her memory virtually all of the two years surrounding the accident. Kim was heartbroken the day he heard his wife say she wasn’t married. She had no memory of her husband either in her head or in her heart. During the initial weeks of Krickitt’s neurological rehabilitation, Kim was by her side pushing her toward recovery and trying to jog her memory with stories and photos. Krickitt, though, resented “that stranger” and told him that she hated him. Kim was acting much more like a father and a coach than the young husband that he was! With medical bills soaring out of control, and no spark in Krickitt’s memory of her hubby- Kim reluctantly returned to work. Many in his position might have given up and left to make a fresh start; after all, 90 percent of the bills belonged to a woman who didn’t even know him. Kim did have doubts about their future, but he had made a vow to God and to Krickitt and he intended to run to it and not from it. Krickitt remained confused as to who she had been. The old Krickitt was gone and she could not grasp the role of being a wife to a man that she had no heart connection to! When all seemed hopeless, Kim finally agreed to see a counselor and when the therapist saw the two of them together, upon his advice- the couple began dating all over again to establish brand new emotional bonds that develop in the early days of a relationship. New memories and new love emerged. Kim was willing to court his bride as if it was all new because for Krickitt, it literally was- and the girl who fell in love with Kim once- fell in love all over again! In a story that only the unconditional love of God could initiate, On May 25, 1996, Kim and Krickitt married again, exchanging new vows and new rings. “Only one thing can surpass forever the painful events we have felt and that is the love I have for you,” Kim promised. Today they are still married with two beautiful kids and they tell their story to anyone willing to listen! Are you ready to give up on the promises that you once made before God and family and friends gathered together in a church many years ago? Like every other couple who ever said “I do,” you will encounter highs and lows and ebbs and flows- but unless the union has been pronounced DOA- could it be that maybe you could rekindle what once was if you just got back to doing and being who you once were? Do you remember the vows you made? When was the last time you lovingly gazed into the eyes of your spouse and reminded each other of those passionate promises that you know you once meant with every living fiber of your soul? I encourage you to go beyond the movie, The Vow- to the book! 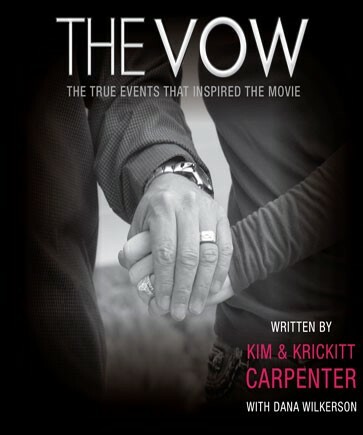 The Vow: The True Events that Inspired the Movie written by Kim and Krickitt Carpenter for less than $10 on Amazon.com. If you promise to read it and don’t have the money- I will buy one for you! You have got my word on it! A vow I plan to keep!